Theresa Rebeck is the right writer to take on writers as characters in a play. Along with an impressive grab bag of Hollywood credits, she is a respected figure both on Broadway and Off. Her list of awards is enough to make any writer sea sick with envy and include an “Edgar Award” (Mystery Writers’ of America), the Writers’ Guild of America Award for Episodic Drama, a National Theatre Conference Award, the William Inge “New Voices In Playwrighting Award” and the Eliot Norton Award. But wait, there’s more! From Brandeis University, she has earned an MFA in Playwrighting and a Ph.D. in Victorian Melodrama (!?!). While not winning awards, pursuing advanced degrees, or writing for hit television shows, she serves as a board member of the Dramatists Guild, a Contributing Editor to the Harvard Review, an Associate Artist of the Roundabout Theatre Company and has taught at Brandeis and Columbia Universites. All this, plus raising two children with her husband (stage manager Jess Lynn) in Brooklyn. This is a woman who has spent some time around writers and knows something about the pressures of academia and the publishing world, as well as the internal drive of unbridled ambition. Plus she has a devastatingly wicked ear for dialogue, and knows how to go for the jugular. In “Seminar”, a quartet of young writers compete for the approval of a famous editor whom they have paid handsomely for a ten session private seminar. Each is brilliant, insightful, ambitious and gifted. Any audience members who have spent time around MFA candidates or other talented young writers will assuredly split their sides laughing with recognition as these young folk and their older mentor fawn, fight and f**k with artistic bohemian abandon. “Seminar” features (from l t r) James Wagner, Natalie Mitchell, Lauren English, Charles Shaw Robinson, and Patrick Russell. Photo Credit: Jessica Palopoli. Few playwrights write language with this degree of sparkle, and the cast has a ball! But beneath the sparkling surface, these are characters with complex souls to match the complex language, and the actors do a fine job of revelation. Patrick Russell has some extraordinary moments as the writer who trades on an uncle’s fame and his own easy facility. When the famous editor slices him up, his understated but deeply felt reaction is remarkable. Speaking of the famous editor, Charles Shaw Robinson is superb as a man who both is and is not as he appears, a character whom audiences will love to hate and hate to love. But love him, they will. Rounding out the cast are Lauren English as a stuck but talented writer who has been reworking the same story for years, Natalie Mitchell as a joyously uninhibited and voracious sexual predator with brains to spare, and James Wagner as her confused but brilliant paramour who nearly misses the boat for both his lovelife and his writing talent. As is customary at San Francisco Playhouse, the production values, especially the subtle and much more than merely serviceable set design by Bill English, are admirable. For anybody who loves writing and writers, who ever wanted to be a writer, who ever struggled with artistic ambitions, this is a must see. And, really, who does that leave out? 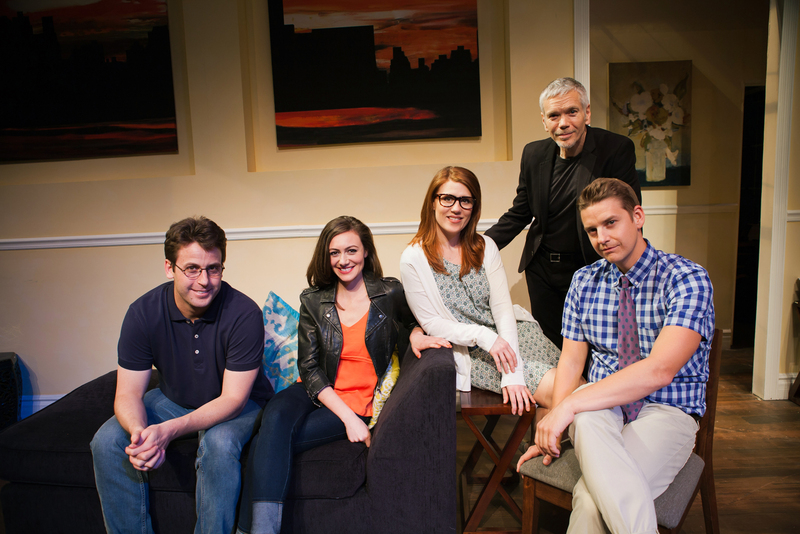 “Seminar” by Theresa Rebeck, produced by SF Playhouse. Director: Amy Glazer. Set Design: Bill English. Lighting Design: Mark Hueske. Costume Design: Abra Berman. Sound Design: Theodore J. H. Hulsker. Kate: Lauren English. Izzy: Natalie Mitchell. Douglas: Patrick Russell. Leonard: Charles Shaw Robinson. Martin: James Wagner. Posted in Reviews.Tagged Abra Berman, Amy Glazer, Bill English, Charles Shaw Robinson, James Wagner, Lauren English, Mark Hueske, Natalie Mitchell, Patrick Russell, san francisco theatre, SF Playhouse, theatrestorm, Theodore J. H. Hulsker, Theresa Rebeck.